Canopy Assembly — Normally twisted wood is a bad thing, but not in this case. The designers envisioned a flowing, segmented series of strips that would form a graceful and twisting curve. While 3-D models looked pretty cool, once our shop built the prototype, we were able to see just how amazing these would look. Made from reclaimed Oak, this will be an overhead canopy for a kiosk, with a similar concept used on the front panel. Front Panel — Finished and ready to ship. The stains, nail holes, and other character marks make an impact for certain, but the design takes the front seat in these truly unique pieces. This kind of collaboration is what sets Pioneer Millworks apart – we speak design, we can understand your vision, and we work to develop solutions to make that vision come to life no matter how twisted it might be. Stay tuned for some finished photos in the coming months — thanks for checking in. On his way to meeting with potential clients, Jered stopped by the new (and only) Chobani yogurt store. He charmed his way in the door even as they were preparing for a commercial photo shoot. 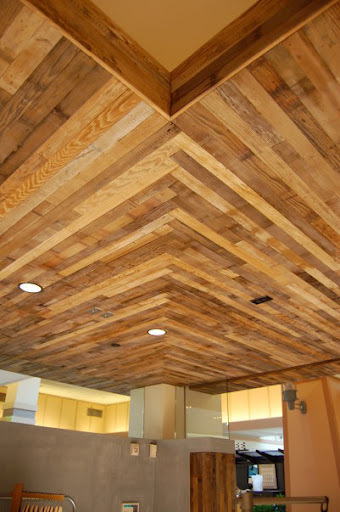 Some of our redwood, salvaged from a Finger Lakes winery, has new life as the fixtures and ceiling paneling in the shop. It really looks stellar! 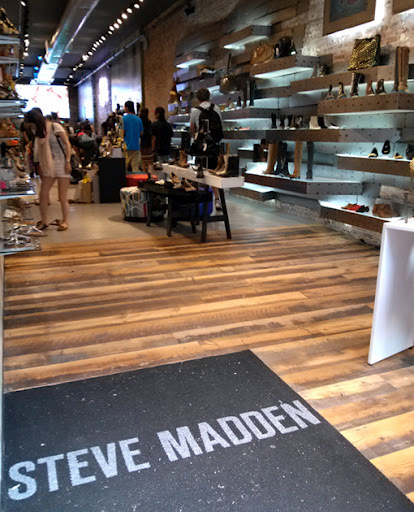 Jered made another quick stop to the newest Steve Madden store capturing a few images of our Grandma’s Attic mixed softwoods flooring and antique grey barn siding on the walls. The contrast of the antique wood with the LED shelf display lighting (see image below) is a perfect example of old melding with new. To think that in the past this antique wood handled whatever Mother Nature and farm animals dished out…today it faces a new challenge: shoe obsessed humans. Speaking of wood that has dealt with animals, Black & Tan, Black reclaimed horse farm fence boards now offer protection to the exterior waiting area at the Sunburnt Calf bar/restaurant. Don’t worry, the black paint was traced back to its original source and was found to be an environmentally friendly, waterborne polymer. It is a non-toxic, non-flammable, solvent free, low VOC waterproof coating used in agricultural settings and safe for use around farm animals…and hungry folks. We’ve been privileged to work with Anthropologie creating unique reclaimed products for their stores throughout the US. We were excited when they called to say their newest store would be in Eastview Mall, Victor NY – right up the road from our Farmington shop. Opening day Jered waited among a group of Anthropologie fans and media for the doors to open. He wasn’t disappointed – the main flooring exceeded even our expectations. A custom mix of reclaimed species, the floor includes barn siding that is partially planed leaving some of the original paint intact. Visually popping throughout the floor are boards previously painted grey-blue. The color is a unique find even in our vast inventory. Shelving and trim called for one-of-a-kind reclaimed wood. Jered recommend reclaimed pickle vats (similar to wine vats).When gently sanded some of the brine and minerals continue to show through in the grain as a light coating of white. Going for a cleaner look the shelving, created by NEWwoodworks, smoothed out the pickle wood giving the bright color and natural black mineral staining a chance to shine. 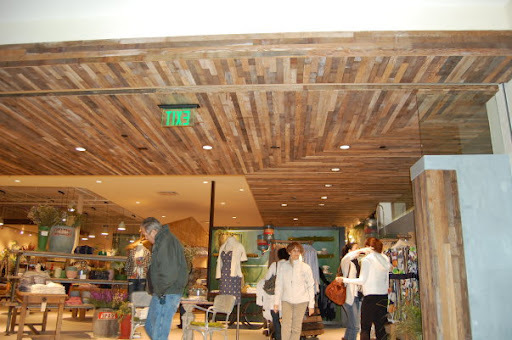 Much of the pickle vat wood was used on the ceiling and overhangs throughout the store. We really loved how the herringbone pattern looked in the corners. If you’re in the area be sure to check out the store. While you’re there scoot over to see our shop, chat with Jered and enjoy the mosaic of our office floor.